Sports Rendezvous: Kayode Olanrewaju: Nigerian forward scores on debut for Shakhtar Donetsk. Kayode Olanrewaju: Nigerian forward scores on debut for Shakhtar Donetsk. Kayode Olanrewaju is on loan at Shakhtar Donetsk from Manchester City. Nigerian forward Kayode Olanrewaju scored on his debut for Shakhtar Donetsk in a 3-0 league victory against Zorya on Sunday, April 1. 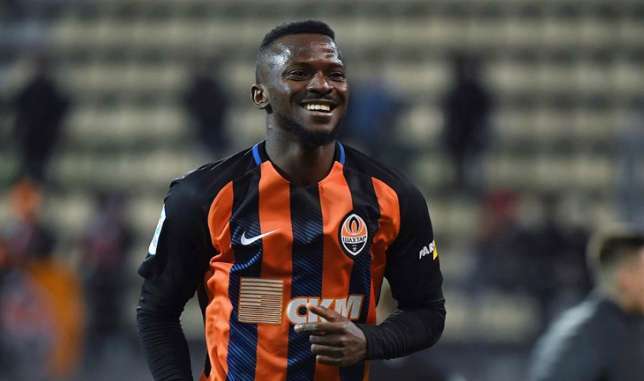 Kayode was loaned out by English Premier League side Manchester City to Ukranian outfit Shakhtar Donetsk until the end of the 2017/18 football season. The 24-year-old Nigerian completed a move to Manchester City in the 2017 summer transfer window but was immediately loaned out by Pep Guardiola side to Spanish outfit Girona. After struggling to get the needed playing time in Spain, Kayode had a wonderful season at Austria Wien that saw him crowned top scorer in the Austrian first division.